We buy it, but prefer making it. Partly because we find homemade so much more delicious, but also because the leftover puréed almonds are equally great in everything from smoothies to on it's own as a healthy dessert topped with honey, fruit and nuts. 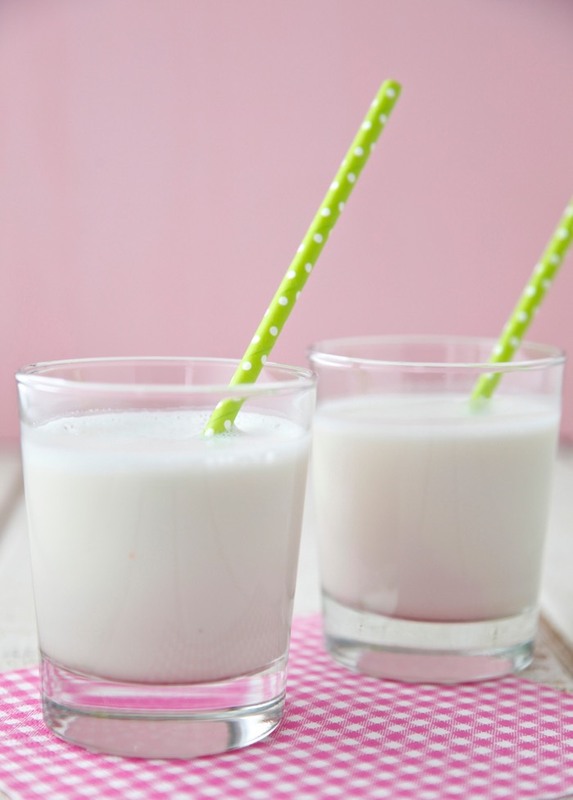 For this Rewind Wednesday I decided to highlight this Almond Milk recipe which debuted on weelicious 6 years ago -- although it seems like just yesterday that I discovered the joy and simplicity of making my own. As I said, we still buy almond milk in the store, however I'm surprised that I've only encountered one store-bought brand that rivals what we can do at home with some good almonds, water and a touch of honey and vanilla. Even if you don't opt to make your own almond milk regularly, I think it's something everyone should try at least once. It's an extremely satisfying experience and you will be surprised at just how utterly simple it is. Oh. My. Lusciousness! I just tasted my first batch of homemade almond milk minutes ago and it is so delicious I ran to the computer, bumped today’s planned “recipe of the day”, and started writing this. 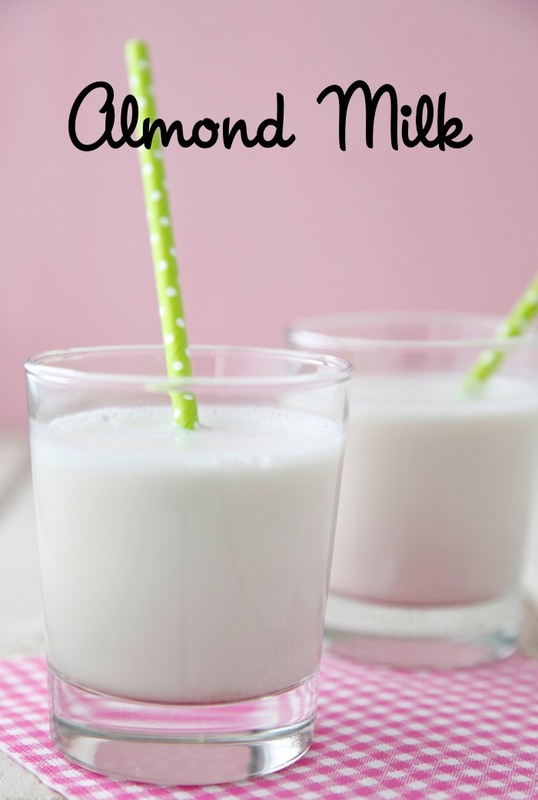 This almond milk is so creamy, frothy and easy to make, you’ll wonder why you ever bothered to buy it in the store. Not only is the milk itself incredible and perfect to add to your own cereal or coffee, but my best little taster just made a case for drinking it all on its own! You should have seen Kenya chowing down on the ground almonds and milky solids which are strained out of the finished milk. He totally made a meal out of it (as did I, stealing bite after bite). Almonds are rich in the antioxidant vitamin E, which boosts your little one’s immune system. They're also a good source of calcium which plays a part in healthy bones, teeth and immune function. Don't feel limited to only almonds, though. You could make this exact recipe with cashews, brazil nuts, walnuts and more. Just pour a touch of this over fresh berries and it's as good as the taste of fresh cream. 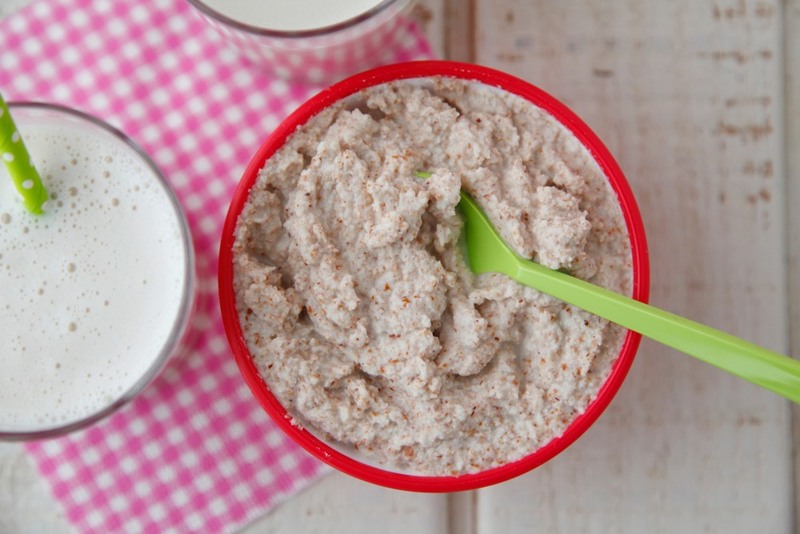 Obviously, if your little one has a nut allergy, this recipe isn’t for them. Again, I do realize that you can buy a box of almond milk at the store to keep handy, but one taste of this recipe and you will understand why it's worth the MINUTES it takes to make your own. 1. Place the almonds in a large bowl and cover with water. Soak at least 4 hours, up to 2 days. Overnight is ideal. 2. Drain the almonds and place them in a blender with the remaining ingredients. Puree until the almonds are in tiny pieces. Discard the soaking liquid and use new filtered water for pureeing. 3. Place a strainer in a large bowl and cover the top of the strainer with cheesecloth (this step is important because the almonds will be in such small pieces that the cheesecloth and strainer need to stop them from going into the milk). 4. Pour the almond milk through the cheesecloth. You may need to do this in stages so the milk can slowly strain through the cheesecloth. It may help taking a spoon to scrape the bottom of the cheesecloth so the milk can pass. 5. Pour the milk and the almond puree into separate containers and refrigerate until ready to drink. Note: the pureed almonds can be saved and eaten as a breakfast with typical oatmeal toppings, or as a dessert topped with fresh berries! This sounds great . . .kind of a silly question, but do the almonds need to be blanched first, or do we just use raw almonds? yes we need to soak it and blanched as it or most nuts contains high amount of phytic acid which is bad in high amount. - You seem to lead such a fabulous and fun life. Personally, I'm not a fan of games or presnet opening. I find it all embarrassing, boring and forced . I'd rather just hang out with friends, eat, and drink (well when not pregnant). I guess it's the same with some of the wedding rituals too. Which is why we had a very small wedding in Italy. can the almond puree be frozen? just made it and my baby LOVED it!! YES the mash can be frozen. I tried it. It won't make more almond milk, but it sure adds a nice touch to muffins! Can you do this in a food processor? I hate cleaning up the parts of my blender that have to be hand-washed. The blender is perfect for this but you can also try it in a food processor, but I don't think it would get as perfect as the blender. Would this have the same nutritional content of the store-bought almond milk in terms of calcium content and such? Almonds are very high in Calcium. 1 cup of whole almonds contains 38% of your daily calcium. I know that once you strain the almonds you are loosing a bit of the nutritional value, but blend them into as small pieces as possible to get the most out of them! Thanks for the info! I recently (a few months ago) stopped drinking cow's milk, although I still use some in cooking, and occasionally eat greek yogurt or cheese. Almond milk is one of my favourite substitutes, especially in my fruit smoothies :) I'm very much a do-it-yourself kind of girl, so being able to make another thing myself is great! When you soak the almonds overnight is it best to soak them in cold water? Hot? Do you then peel them or blend with the skin? Thanks!! I soak them in cold water and I don't bother with peeling them since I'll be straining out all the chunks anyway! Yes, drain the almonds before pureeing! I have made this milk before and LOVED it. It's a little pricey for me, but i will be using this recipe this weekend. Once i start drinking this milk, don't want to stop. so delicious! I am going to try this and I love that they are soaked first. How long will it last in fridge? With bulk organic almonds being $12 lb at my WF store, I don't want any of it to go to waste. Thanks. It will last about 7 to 10 days in the fridge! 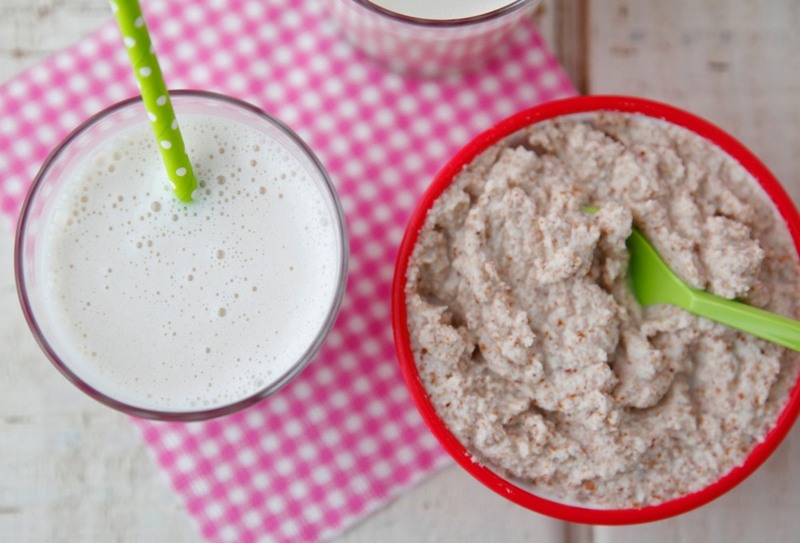 You can also make granola or fig bars with the almond puree. In a pinch, if I need almond milk immediately or just need a small amount, I use Trader Joe's Raw Almond Butter and water in the Vitamix. I think it is about 1 Tbsp to a cup of water, but you can play around with the ratios depending on how thin or thick you want it. No more excuses ~ I must make my own almond milk!! Hopefully this isn't a dumb question, but is vanilla extract safe for little ones under 2 since it contains alcohol? I just made a batch and it is YUMMY so I hope so! Also, can almond milk be frozen? Was thinking I'd make a double batch next time and freeze some for later. Which store in Nairobi-Kenya can I source almonds or almond milk?